The City updated its “Elections” site, which includes the 1976 to 2010 results. Lots of data to crunch, and here are several highlights….. Naturally, when there’s no Mayor’s race (or not a hotly-contested one), fewer residents are inclined to vote. Will our current Mayor be acclaimed in 2014? Seems likely. Average voter turnout is underwhelming in any event. Just over 32% for general elections. – Perennial candidate Mark Carr, and brother of current Regional Chair Gary Carr, has run 5 times in 3 decades (1991, 1994, 1997, 2000, 2010). He’s won twice – nearly making a remarkable comeback in 2010 after his last victory 16 years earlier (see above). – Former Mayor Cam Jackson was not new to municipal politics, when he resigned as Burlington’s MPP and won in 2006. He was a Trustee on the Board of Education/Public School Board, starting in 1976 – until he was first elected to Queen’s Park in 1985. – Local lawyer Chris Haber was unable to win a Ward seat in 1976, but found a different way to become part of the municipal landscape in 2013 – committing in excess of $1.3 million over the next 20 years to put his name on a new recreation centre. I trust that doesn’t set a mandatory precedent for all local lawyers who’ve lost in the past! – Community activist/fundraiser Keith Strong lost a close Ward race in 1978, but must know a lot about running. He helped guide current MPP Jane McKenna to Queen’s Park less than a year after 2010 – when she finished last in the 5-person Ward 1 race. 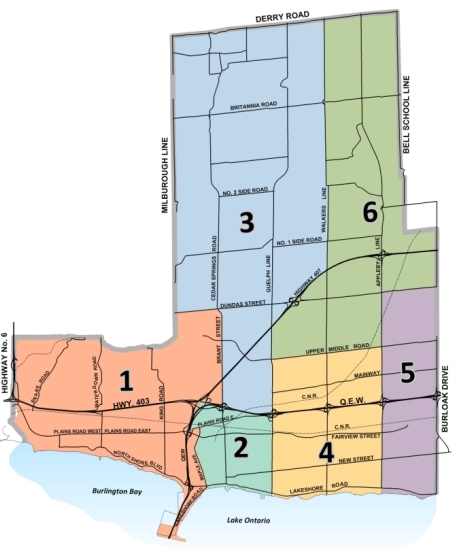 – Current Ward 3 Councillor John Taylor has a record befitting a ‘dynasty’. First elected in 1991, and acclaimed in 1997, his percentages of total votes are impressive: 83%, 58%, 88%, 78%, 62%, 51%. A 70% average. Acclaimed in 2003, only current Ward 1 Councillor Rick Craven comes close to building a Taylor-like ‘dynasty’: 65%, 59%, 55%. A 60% average. However, both Councillors face declining numbers. – Spending does not assure victory, nor how you finish. Witness the 2010 mayoralty race, and a $115,100 spending limit. Winner Rick Goldring ($4.50 per vote) and 4th-place finisher Philip Papadopoloulos ($48.28 per vote) each spent nearly $100,000; while 2nd-place finisher Carol D’Amelio ($9.28 per vote) went over $100,000, and 3rd-place finisher Cam Jackson ($8.20 per vote) spent just over $80,000. And there are many more stories to tell …..from the election loss by current Ward 2 Councillor Marianne Meed Ward to current Ward 1 Councillor Rick Craven in the 2006 Ward 1 race (maybe that explains, in part, tensions between them at the Council table? )…..to the incredibly close race that same year for the mayor’s job (the top-3 finishers split the vote percentages at 35%, 32%, 30%). Are you going to make a positive mark in Burlington’s electoral history – whether as a candidate, or a voter, in 2014?